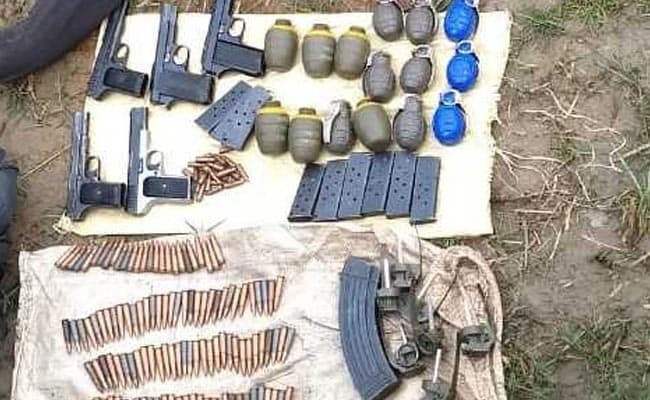 The recoveries made from the terrorist included two assault rifles along with two magazines and 234 rounds of bullets, five pistols with 10 magazines and 60 rounds, 15 hand grenades and 12 fuses for Improvised Explosive Devices. A heavily-armed Pakistani intruder was shot dead today along the border in Akhnoor sector in Jammu and Kashmir, the Army said, preventing the plan of terrorists to disrupt the forthcoming panchayat elections in the state. The recoveries made from the terrorist included two assault rifles along with two magazines and 234 rounds of bullets, five pistols with 10 magazines and 60 rounds, 15 hand grenades and 12 fuses for Improvised Explosive Devices, Jammu-based Army PRO Devender Anand said. "This huge cache has scuttled the nefarious plans of the terrorist outfits to derail peace and harmony in the region and disrupt the forthcoming panchayat elections in the state," he said. The nine-phased panchayat elections will begin November 17. Mr Anand said an ambush party of the army killed the terrorist on this side of the international boundary at about 1.50 pm. "The entire area near the scene of the gunfight has been cordoned off and search and destroy operation is still in progress," Mr Anand said. "The timely intercept of the intrusion of the terrorists with the cache of arms, ammunition and other war like stores has thwarted any possible untoward incident, planned by the terrorist during the scheduled elections in the state," the Army PRO said. The infiltration bid comes after a series of ceasefire violations by Pakistan which left three army personnel and a porter dead and three Border Security Force (BSF) troopers injured on Friday. "The Indian Army is carrying out relentless and robust anti-infiltration operations in the state to break the backbone of terrorism and nip the designs of anti-national elements and the enemy to foment trouble south of the Pir Panjal ranges in Jammu and Kashmir," the PRO said. The porter was killed by a Pakistani sniper along the sector followed by similar attacks from across the border in Sunderbani and Noushera sectors of Rajouri and Krishna Ghati sector of Poonch over the past three days. The casualties suffered by Pakistan in the retaliatory action could not be ascertained immediately but several of their posts including the ones with snipers were hit over the past four days, officials said.